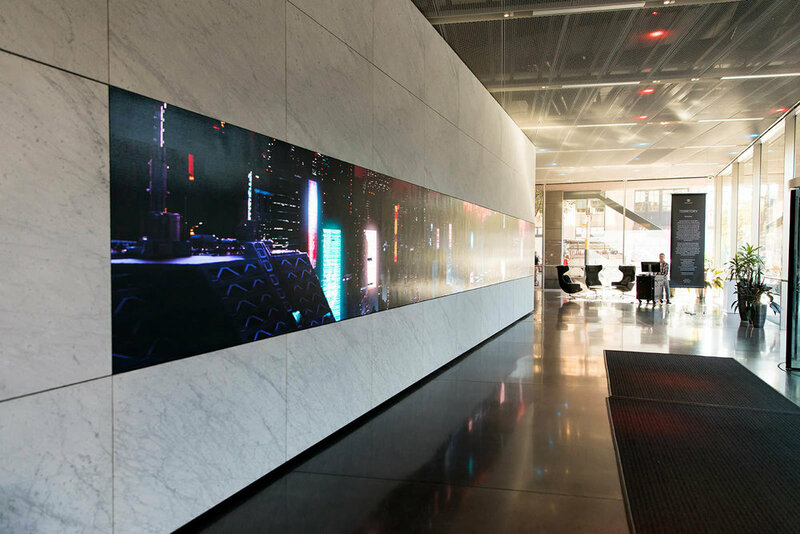 Commissioned by Dolby® Gallery to create an original digital animation for the venue's 62-foot LED screen, Territory Studio San Francisco drew on their motion graphic expertise for film and games to create a uniquely immersive experience. While the 62-foot visual canvas was expansive, Sono Sanctus worked to further grow the story in the viewer’s imagination through music, diegetic sound, and detailed radio dramas. An ambient music track, mixed across 52 full-range speakers and 34 subwoofers, weaved through and filled the L-shaped room, surrounded the audience, and set a cinematic tone to match the mood of the futuristic visuals. The next layer of sound was designed to supported on-screen action, allowing ships and other visual elements to be tracked aurally across the space with their movement. Finally, two intersecting radio dramas were positioned in discrete spaces at opposite ends of the room, allowing astute viewers to engage at length with each drama, listening in until the stories eventually converge. To the casual viewer, these dramas also added an aesthetic that blended seamlessly with the other audio elements to enhance and expand the cityscape. This was an exciting opportunity to design for an audio system unlike any other, enabling layering of creative elements in a seemingly endless sonic canvas to create a whole and moving experience.